Can Cuba Escape the Corruption Curse? Corruption poses an insidious challenge to political legitimacy and economic growth in countries across the world. In many new democracies, the transition away from authoritarian rule has failed to end corrupt practices and even created new opportunities to harness public resources for private enrichment. Similarly, Cuba’s success or failure in controlling corruption will quickly emerge as a central test for the legitimacy of any democratic government that takes root after Fidel Castro. The historical precedents are not reassuring. More than 15 years since the fall of the Berlin Wall, Eastern Europe is still awash in graft, and Russia’s economy remains distorted by the fraudulent privatization schemes that followed the collapse of the Soviet Union. Meanwhile, corruption continues to undermine democratic consolidation in Latin America and the Caribbean, and even the East Asian tigers remain mired in “crony capitalism.” In this context, Cuba will face formidable challenges in enforcing the rule of law during a transition period, and the legacy of misrule left by both Castro and his predecessors will conspire against easy success. Corruption has played a crucial role in Cuba’s past and will remain a feature of the island’s political and economic landscape in the near future. While the battle against corruption will be marked by slow progress and frequent setbacks, it need not be in vain. Cuba’s chance to achieve political legitimacy and economic prosperity is inextricably linked with how deftly future policymakers can outmaneuver corrupting influences and work to strengthen institutions over time. The question facing Cuba, therefore, is not whether corruption can be quickly eliminated under a new government, but rather how to ensure that the country’s future democracy is not severely or even mortally wounded by the breakdown of existing institutions, an explosion of theft of state assets, and a surge in organized crime. After more than 45 years of authoritarian rule, Cuba will require new and revitalized strategies to ensure that extreme levels of corruption do not eclipse the island’s democratic prospects. Corruption is defined as the misuse of public office for private gain, and it occurs in all types of governments in both the developed and developing world. In countries with low levels of development and high degrees of inequality, corruption can take the form of bribery, graft and state capture that skews state and private resources away from the poor and towards those with political or bureaucratic influence. In centrally planned economies like China, Vietnam and the former Soviet Union, individuals connected with the ruling party are often positioned to reap ill-gotten gains without risking deep public scrutiny. Corruption tends to be most prevalent in countries where the government exercises greater control over economic resources, but even democratic societies often witness abuse of public property by political and private elites. It is a cruel irony that newly democratic regimes often prove no better at controlling corruption than the authoritarian and centralized governments that they replaced. Why do new democracies struggle with corruption? While there is no single cause—or set of causes— that explains the high incidence of corruption in the developing world, corruption typically flourishes in countries with large power disparities, ineffective institutions, weak civil society, and low levels of social capital. In theory, democratic procedures and greater transparency should curb the abuse of public office and lay the groundwork for more honest government. The reality is not so simple. The dispersion of power within a democracy reduces the absolute authority of the state, but it also opens up opportunities for graft among a much broader range of actors, including citizens who have spent decades being disenfranchised by authoritarian governments. Although widely recognized as a key obstacle to development, corruption remains a frustrating and elusive topic: hard to quantify, difficult to control, and with relatively few quick solutions. Existing research offers great insight into the negative effects of corruption and sets forth sensible goals such as building strong institutions, establishing an effective legal and judicial system, encouraging transparency, empowering civil society, and cultivating honest political leadership. But these goals are elusive, and the process of strengthening political norms and democratic accountability has been filled with setbacks, surprises, and dead ends. In many countries, the cyclical nature of anticorruption campaigns fuels public cynicism; dozens of leaders have come into high office pledging to fight corruption, only to leave tainted by their failure to make progress, or, worse, accused of corruption themselves. In Latin America, it is hardly unusual for former presidents to watch their legacies dissolve amid corruption allegations, yet even disgraced leaders often retain support and influence over the political process. Corruption in new democracies typically takes two forms: administrative corruption and state capture. Administrative corruption, such as bribery, can occur at all levels of government, ranging from the small fee paid to expedite paperwork to multi-million dollar kickbacks to help secure government contracts. State capture is an even more pernicious phenomenon that allows officials and party leaders to shape the legal and regulatory environment to favor their own interests. While this was common practice in Eastern Europe and the former Soviet Union when the legal system was in flux during the post-communist transition, it also occurs in developing countries in Africa, Asia and Latin America. When the democratization process is accompanied by a visible rise in corruption, this can cut deeply into support for democratic rule and market economics and provoke nostalgia for the defunct policies of authoritarian governments. When considering corruption in post- Castro Cuba, the most relevant examples are the post-communist governments in Eastern Europe and the former Soviet Union that emerged in the early 1990s, and the democratic governments that replaced military dictatorships in Latin America. Despite very different circumstances, these experiences offer important insights into the challenges that will confront Cuban democracy. The collapse of the Soviet Union in 1991, followed by the subsequent emergence of 15 successor republics, ranks as one of the most significant democratic transitions in the last century. However, it also demonstrates the degree to which corruption can pose deep challenges to democratic consolidation and retard economic performance. Although the transition irrevocably ruptured the fusion between public and private interests that had existed under communism, the new boundary lines between the state and the economy were often murky or poorly defined. High level party officials—known as the nomenklatura— quickly moved to retain their positions of privilege and influence as the ruling oligarchs in the new system. The sudden lurch towards capitalism allowed them to ensconce important advantages for vested interests in the reformed rules and institutions. State capture in the former Soviet republics privileged key groups in both the public and private sector through new laws, decrees and regulatory policies. Russia therefore presents a cautionary tale for Cuba that should not be taken lightly. Both countries share the characteristics of highly concentrated economic power, underdeveloped political systems and weak civil society. Today, Russian democracy continues to live in the shadow of widespread state theft and assetstripping that constituted the original sin of the region’s new capitalism. In particular, Russia’s experience with privatization had devastating long-term repercussions. The government of Boris Yeltsin implemented the initial “voucher” stage of enterprise privatization in 1992, distributing 150 million privatization vouchers to the population for investment in state-owned enterprises at public auction. Within five years, about 130,000 enterprises had become privately- owned or stock corporations, representing nearly half of all non-agricultural entities. Yet ordinary citizens were largely excluded from the process, due to lack of information, limited transparency, and insufficient knowledge about how to pursue their ownership rights. By contrast, wily enterprise managers quickly moved to buy controlling shares in pretransition enterprises, often at far below the actual value. Russia’s second wave of privatization only deepened corruption-fueled inequality through the “loans-forshares” scandal that allowed giant Russian companies to be turned over to private investors for bargainbasement prices. As collateral for bank loans, Russia auctioned off major enterprises at low prices to a limited number of bidders. When the government defaulted on the loans in 1996, a handful of “oligarchs” claimed the assets and were transformed into instant billionaires despite having paid only a tiny fraction of the actual value of enterprises in important sectors like oil, natural gas and telecommunications. The Russian parliament later concluded that potential revenues for this stage of privatization were undercollected by a factor of 280. The result was that several of Yeltsin’s associates became billionaires, but the country was unable to afford paying pensioners their $15 a month. Russia’s explosion of corruption produced potent disappointment with democracy, and citizens used the popular saying “the fish rots from the head” to sum up their disgust with the high-level graft that occurred. The massive enrichment of a relative few seemed even crueler because it coincided with a steep drop in economic output and sharply rising poverty and inequality. The poor thus suffered twice over— once when their existing safety nets disappeared, and again when public resources were stolen and international assistance was misdirected. In addition, privatization was rushed because there was a total breakdown in discipline that forced rapidly assembled programs to be implemented as pre-emptive action against “spontaneous privatization” by greedy bureaucrats. In fact, asset-stripping began shortly before the fall of communism. Once the Soviet Union broke apart, the theft of state assets by enterprise managers, politicians and bureaucrats began to unfold at an intolerable rate. Although rushed and poorly designed, state-run privatization programs quickly emerged as the only alternative to allowing state-owned enterprises to succumb to wholesale theft. While the process became somewhat more transparent and participatory, privatization ultimately failed to direct state assets towards positive social and economic goals. In this view, Russia’s roughshod privatization process served as a last-ditch measure to prevent the outright dismantling of state enterprises for no compensation whatsoever. Nevertheless, there is little question that the legacy of Russia’s shock therapy has seriously undermined that country’s subsequent democracy, which has faced further setbacks during the rule of Vladimir Putin since 2000. According to the Washington- based Freedom House, Russia today is “at least as corrupt as its communist predecessor,” with 72 percent of Russians citing a positive view of the old regime, compared to a 47 percent favorable rating for the current government. Eastern Europe experienced a less severe economic collapse than the Soviet Union—the region’s GDP dropped by 15 percent compared to Russia’s nearly 50 percent plunge—but these new democracies suffered a similar pattern. The French novelist Balzac coined the phrase that “behind every great fortune there is a crime,” but Eastern Europeans prefer to say “never ask a man where he made his first million.” In addition to flawed privatization processes, the region’s corrupt and poorly managed banking system provided the lifeblood for the “kleptocracies” that later emerged. In its 2004 Corruption Perceptions Index, anti-corruption watchdog Transparency International consistently ranks Eastern European nations at levels equivalent with many lesser-developed countries of Africa, Asia and Latin America. For example, the Czech Republic shares 51st place with El Salvador and Trinidad and Tobago, and Poland and Croatia share a four-way tie for 67th with Peru and Sri Lanka. Based on surveys of international and private institutions, these measures reveal that perceived levels of corruption in Eastern Europe continue to lag behind the developed world. This conclusion is supported by closer analysis. In a 2001 survey of 10 countries negotiating accession to the European Union—a group that included Bulgaria, Hungary, Poland, the Czech Republic and Slovakia, among others—trust in public institutions was dismally low. The police were trusted by only 28 percent of the population, and that number fell to 25 percent for the courts, 14 percent for parliament, and 12 percent for political parties. In addition to state capture, the World Bank has estimated that administrative corruption accounts for 3.7 percent of firm revenues in the successor republics of the Soviet Union, and 2.2 percent of revenues in Central and Eastern Europe. In countries with the highest levels of corruption, that figure can account for 25 percent of annual firm profits. Indeed, the plague of corruption continues to haunt even the Eastern European countries considered to have managed the most successful transitions. In the Czech Republic, nearly three-quarters of the population considers itself to be victims of illicit schemes perpetrated by the rich and powerful, and Freedom House reports that “receiving a government contract is considered impossible without paying a bribe or having political connections.” Slovakia, its sister republic, generally scores even worse, despite increased anti-corruption measures, including reforming public administration and passing criminal statutes against racketeering, bribery and fraud. Poland ranks lower still, notwithstanding progress in cutting red tape and raising civil service salaries, coupled with more aggressive investigations into government wrongdoing and new legislation against money laundering and bribery. Hungary emerges as one of the countries where corruption has been held to a medium level, where bribes are not uncommon but not a prerequisite to doing business. Nevertheless, Hungary’s 10–person privatization agency saw the forced resignation of eight members during the mid-1990s due to corruption allegations in the sale of stateowned enterprises. Only tiny Estonia and Slovenia have managed to keep corruption to more manageable levels, in part because these countries had fewer vested interests and more developed civil societies at the time of transition. Of course, corruption in the former Soviet bloc was widespread long before the region moved towards a market economy, and it would be disingenuous to blame the persistence of the problem entirely on how the transition was managed. Under the Soviet system, mid-level bureaucrats generally benefited from the system of patronage that provided better schooling, private houses and greater access to food and medicine. Still, to many citizens, the comparatively discrete corruption of the Soviet era seems almost quaint compared to the ostentatious windfalls that materialized for the oligarchs during the transition. The wave of democratization provoked multiple changes with contradictory effects on corruption levels, but the shift towards a market-oriented economy indisputably created lucrative new opportunities for graft. The very process of reducing state intervention in the economic sphere was managed by a state controlled by the very vested interests that it was supposedly seeking to extirpate. The experience of the former Soviet Union and Eastern Europe demonstrate how failure to control corruption can leave lasting scars on the democracies that emerge from the ashes. Latin American democracy emerges from very different political and social roots than the former Soviet bloc, but endemic corruption continues to pose a major problem for democratic governance. Of course, there are important distinctions. Eastern Europe and the former Soviet Union have been indelibly marked by the massive wave of corruption that accompanied the collapse of communism because it distorted the foundation of their new societies during a time of great hope and expectation. By contrast, Latin American societies have experienced greater continuity in the corruption that existed under authoritarian governments and persists in new democracies. In Mexico, for example, corruption has been described as “the oil and the glue,” where corruption emerged as a useful way of bridging the gap between idealistic laws and the management of daily life. Today, conflicting views of corruption are evident throughout the region; according to the United Nations Development Programme, nearly 42 percent of Latin Americans say they would be willing to tolerate a certain degree of corruption “provided things work.” However, in 2002, the respected Chile-based Latinobarómetro polling organization found that citizens ranked corruption only behind unemployment as the region’s most pressing problem. Worse, 80 percent of Latin Americans believed that corruption had risen over the previous year, and 71 percent regarded civil servants as corrupt. In fact, Latin Americans appear to feel that corruption will be an ongoing feature of the political landscape. In the 2004 Latinobarómetro poll, more than half of all respondents believed that corruption would either never be eliminated from their countries or it would take much longer than 20 years to disappear. More than one-fifth of those polled said they experienced corruption directly during the previous year, despite the fact that only 16 percent said they would pay or negotiate a bribe to expedite an important procedure, compared to 60 percent who said they would denounce an official who requested a bribe. In every Latin American country surveyed, at least 20 percent of respondents thought that it was possible to buy off a policeman, judge or ministry official, and this belief was expressed at levels approaching or exceeding 50 percent in Mexico, Paraguay, Argentina and Ecuador. Other regional studies have shown that the negative impacts of corruption can be especially pernicious for the poor. In surveys of Bolivia and Honduras, exposure to corruption is found to be much more widespread in urban than in rural areas. This is a general trend throughout Latin America, and it reflects the fact that government is often more present in the cities than in the countryside. But Latin American corruption extends far beyond administrative graft to include levels of state capture that in some cases rival post-communist countries. In a survey of international executives conducted by the World Economic Forum in 2003, Latin America ranked second of nine regions—ahead of Eastern Europe and behind only the former Soviet Union— in terms of perceived state capture as defined by excessive or illegal influence of powerful firms and individuals on state policymaking. As the World Bank noted in a 2004 study, state capture has long represented a pernicious trend in Latin American countries. Prominent examples have included the personalistic rule of the Somozas in Nicaragua or Stroessner in Paraguay, and the corrupt “partidocracia” that ruled Venezuela until the end of the 1990s. Although these powerful cliques and dynasties have given way to electoral democracy in every country in the hemisphere except Cuba, their legacy of concentrated wealth and influence continue to hinder democratic governance. Indeed, any examination of corruption in Latin American and the Caribbean yields a litany of woes. In Argentina, former President Carlos Menem faced charges that he approved the illegal sale of arms to Croatia and Ecuador in the 1990s in violations of United Nations weapons bans, and the U.S. Commerce Department has reported that “government corruption and private sector business fraud are common complaints [and are] a significant problem for trade and investment.” Brazil witnessed the resignation of former President Fernando Collor de Mello amidst corruption charges in the early 1990s, and a more recent political corruption scandal imperiled the presidency of Luiz Inacio Lula da Silva and has claimed several leading members of his Workers’ Party. Mexico’s deep-rooted graft continues to be a significant factor in that country’s politics, and the government of Vicente Fox is investigating the apparent transfer of $170 million from the state-run oil company Pemex to the former ruling party during the 2000 election. In addition, the brother of former President Carlos Salinas was prosecuted on corruption and murder charges. In Transparency International’s 2004 global survey of 145 countries, only Chile, Barbados, Uruguay, Costa Rica and Suriname within the Latin American and Caribbean region cracked the top 50 least corrupt countries, while Bolivia, Honduras, Guatemala, Paraguay and Haiti all ranked with the bottom 30 most corrupt countries. In addition, the Latin American and Caribbean region boasts three of the 10 most corrupt leaders worldwide based on their estimated stolen wealth: Jean-Claude Duvalier of Haiti, who is estimated to have stolen $300 to $800 million from 1971 to 1986, Alberto Fujimori who allegedly took $600 million during his 10–year reign in Peru, and Arnoldo Alemán who emptied $100 million from Nicaragua’s treasury between 1997 and 2000. Despite notable democratic progress, Latin American societies are haunted by a lack of trust that fuels corruption and depletes the collective value of all social networks in a given society that would otherwise facilitate improved governance—known as “social capital.” As in much of East Asia and Africa, social capital in Latin America primarily exists within a narrow circle of family and personal contacts, instead of extending more broadly to other citizens as occurs in the more developed societies of Europe and the United States. Far from transgressing social rules, corrupt officials in many countries are responding to societal expectations that helping family and friends takes precedence over protecting the general public interest. An unhealthy byproduct is that stealing from public officials on behalf of one’s family—or abusing the public trust to steal from strangers—is culturally reinforced because a lower standard of behavior is required in the public sphere. In this sense, the double moral standard—or doble moral—that permeates Cuban society is an extreme version of a common cultural malady in Latin America. The negative economic effects of corruption have been widely documented, but the shift from authoritarian regimes to democracies has contradictory effects that can expand opportunities for corruption in some areas while reducing it in others. Furthermore, institutional reforms that do not help to reshape underlying cultural patterns are unlikely to achieve much progress. The economist and Nobel Prize laureate Amartya Sen argues that, without building a new standard of behavioral norms, organizational reforms are not enough to eliminate corruption. He sees corruption as part of a cyclical pattern that can be either reinforced or reversed through a combination of political institutions and leadership: “Just as the presence of corrupt behavior encourages other corrupt behavior, the diminution of the hold of corruption can weaken it further. In trying to alter a climate of conduct, it is encouraging to bear in mind the fact that each vicious circle entails a virtuous circle if the direction is reversed.” In Eastern Europe, Russia and Latin America, newly democratic societies are still struggling to overcome the political and economic distortions sown by corruption and state capture. Concern about Cuba’s potential loss of state authority sometimes prompts analysts to argue that Cuba should follow China’s path towards economic reform in the hope that this will lead to greater political liberalization. While this prescription may have some merits when compared to the damaging privatization reforms that were carried out in Eastern Europe and the former Soviet Union, a closer assessment reveals that China is hardly a model worthy of emulation in the sphere of anti-corruption. Instead, China’s market socialism has failed to erect proper boundaries between official power and private markets, leaving the government unable to address corruption except by mobilizing the repressive instruments of the state. Before China started down the path of market reform, corruption did occur but party apparatchiks also held themselves in check to avoid a crackdown by party authorities. Official power could be withdrawn at the leadership’s discretion, and civil servants were hesitant about overreaching and perhaps losing access to the system of perks and preferences. However, that level of discipline has broken down over the last decade, allowing corruption in China to soar to previously inconceivable levels. At China’s 15th Party Congress in October 1997, Chinese Premier Jiang Zemin declared that the “fight against corruption is a grave political struggle vital to the very existence of the party and the state.” In 1998, China’s People’s Liberation Army was stripped of its commercial operations by the ruling party. The military’s participation in economic affairs had simply become too worrisome for high officials; the divestiture was apparently prompted by the disproportionate corruption of a half-dozen militarycontrolled companies, including pervasive oil smuggling that was debilitating China’s oil monopolies. While the army was allowed to continue engaging in some productive activities, it was prohibited from any commercial activities such as trade, tourism and telecommunications, among others. According to one China analyst, the move resulted in the transfer of almost 3,000 firms owned by the PLA and People’s Armed Police to local governments, while nearly another 4,000 were shut down. Yet the army continued to work in vital sectors, including civil aviation and railways. The divestiture did incur political costs, including bruising conflicts over the disciplinary measures to be taken for cadres alleged to be involved with profiteering and smuggling. According to the Far Eastern Economic Review, at least 23 company executives ranked major general or above fled the country following the divestiture. The anti-corruption charges have deepened a rift between China’s military and civilian leadership. Military corruption has moved from an extremely dangerous problem to a serious but manageable matter of discipline. Rather than attempting to eliminate corruption entirely, China’s cyclical anti-corruption campaigns appear intended to control it at an acceptable level. While the revealed rate of corruption appears to have leveled off, available data indicate that the intensity of corruption rose dramatically in the 1990s. For example, while only 652 cadres at or above the county level were charged with economic crimes in China in 1992, that number rose to 2,670 in 2001. At the same time, cases of ordinary corruption appeared to decrease over that same period. Thus, China’s levels of corruption experienced a qualitative shift during the 1990s, during which time more high level cases involving much greater sums of money proliferated, even as reported instances of lower-level corruption remained static or even decreased. China has attempted to address these developments through periodic anti-corruption campaigns, but these have proven a weak substitute for regular policing. Instead, they represent an attempt to control corruption using fear and uncertainty, generated through random arrests, humiliation and public denunciation. Instead of striving to implement the rule of law on a regular basis, China appears to have a chosen a strategy based on episodic anti-corruption crackdowns as the cornerstone of its efforts to contain corruption. The inadequacy of these measures recalls the ancient Chinese saying that “the mightiest dragon cannot crush the local snake.” In early 2005, China was hit by a wave of bank robberies carried off by branch managers and corrupt company executives. At the Bank of China, a branch manager embezzled $100 million and subsequently vanished. Other commercial banks suffered from a rash of insider theft, including $8 million that was stolen from the China Construction Bank and a conspiracy discovered at another commercial bank to steal nearly $1 billion. The head of China Construction Bank resigned after it was discovered that he accepted a bribe of $1 million from Alltel Information Services. Government investigations have found that billions of dollars have been robbed from state owned companies. The country’s banking and financial systems have simply been unable to impose enough financial safeguards and controls to ensure that the investment fueling the country’s growth does not get illicitly siphoned off by corrupt parties. The consulting firm McKinsey & Company estimates that China’s state-run banks had bad loans of $204 billion in 2004. Chinese officials estimate about $8 billion was pilfered from state owned enterprises in 2003, and at least two-dozen government officials in China have been sentenced to death for corruption in recent years. In the final analysis, China’s plague of corruption will worsen as long as the rule of man trumps the rule of law, and personal connections—known as guanxi—are the only available antidote to the hidebound communist bureaucracy. Corruption in contemporary Cuba shares some characteristics that exist in centrally planned economies and throughout Latin America and the Caribbean. During the first 30 years of Fidel Castro’s regime, Cuba exhibited many of the dysfunctions evident in the old Soviet Union—such as a complex web of patronage and negligible economic liberalization— combined with some of the small scale bribery and graft that exists throughout Latin America. However, Cuba differed from the rest of the region in that the 1959 revolution permitted Castro to evict the island’s previous oligarchs and rule in their place. This system remained intact until the early 1990s, when the dissolution of the Soviet Union forced a new economic reality onto Cuba. Faced with a collapse in its international trading partners and a resulting 35 percent drop in GDP, the Castro government was forced to make several economic changes with farreaching consequences for Cuban society. In 1993, the legalization of U.S. dollar holdings in Cuba created a dual currency system that fueled previously unheard-of levels of income inequality in the communist system. The search for foreign direct investment and the subsequent opening of the tourism industry dramatically increased the levels of foreign currency that were entering the state-owned enterprises. Self-employment was allowed in a limited number of categories such as personal services and private restaurants, but severe scarcity forced much of the Cuban population into the underground economy to earn dollars illegally in both traditional activities and illicit behavior such as prostitution. These changes inverted the supposedly socialist norms of Cuban society, transforming Cuba’s “normal” if regrettable socialist-style corruption into a deeper cultural and economic malaise. In today’s Cuba, survival for much of the population entails living outside the law. This creates multiple obstacles to any useful discussion of corruption, because the very term inserts the type of stealing, trading and “inventing” prevalent in Cuba into a moral context that its citizens would not recognize. Hewing closely to the political and economic explanations that define corruption in the developing world, there are several areas where Cuba is more corrupt, and other where it is less so. Cuba suffers from two extreme maladies: abuse of power and state capture. After nearly 50 years at the helm of Cuba’s political system, Fidel Castro and the Communist Party retain near total control, thereby limiting the possibility of citizen appeal against arbitrary or unjust government action. In addition, the Cuban government’s command over economic resources has transformed the island into the most captured state in Latin America. In recent years, even Cuba’s tiny private sector has become increasingly besieged by higher taxes, stricter licensing requirements and more punitive fines for small infractions. On the political level, of course, this power manifests itself in the iron-fisted efforts to ensure that Cuba’s independent political movements are divided and weakened and, in many cases, its leaders incarcerated. In Castro’s fiefdom, the state and party will tolerate no economic or political rivals, while permitting a system of special advantages to evolve for the country’s ruling elites. The prevalence of abuse of power and state capture in Cuba leads to a third area of corruption: the theft of public goods and the creation of thriving black markets that many Cubans depend on for access to basic resources. Faced with low salaries paid in Cuban pesos and the high costs of goods available in dollar stores, many Cubans engage in prohibited entrepreneurial activities that would be legal in most market-oriented countries. By the late 1990s, the stark disparities introduced by the legalization of the U.S. dollar had shattered the egalitarianism that had existed Cuba’s society during the Soviet bloc years, when the basic relationship between wages, incomes and prices was the same for the majority of citizens. In the aftermath of this adjustment, corruption in Cuba metastasized from a primarily government driven phenomenon into a societal affliction that forced ordinarily law-abiding citizens to steal, buy and sell goods in the island’s black markets as a means of survival. For example, when Cuba’s fisheries reported a 10 percent drop in its 2002 catch from the previous year, large scale mismanagement, corruption and petty theft were cited as the main factors. Similarly, the president of the Cuban Postal Company, Juan Marañón Depestra, has conceded that mail from abroad is regularly subject to theft. At present, this type of corruption in Cuba has become so routine that the public is becoming immune to scandal. It is tempting to aggregate these facts into an indictment of the Cuban system as hopelessly and irretrievably corrupt, but not all the evidence points in this direction. According to Transparency International, for example, Cuba consistently ranks in the top half of all countries worldwide and in the middle of the pack for Latin America and the Caribbean. In the 2004 Corruption Perceptions Index, Cuba ranked 62nd out of 145 countries—tied with Panama and ahead of Mexico, Peru, the Dominican Republic and nine other countries in the region. Officials from development agencies in Canada, the European Union and the United Nations system consistently rate Cuba as an effective partner for implementing foreign aid programs, despite the fact that Castro’s pugnacious diplomacy has made several countries reconsider their assistance. European governments have also praised Cuba for its counter-narcotics efforts, and even U.S. officials have grudgingly admitted that the Castro government has been a useful partner in stemming the flow of drugs through the Caribbean. While administrative corruption in Cuba is not uncommon, it has hardly reached the heights seen in China. 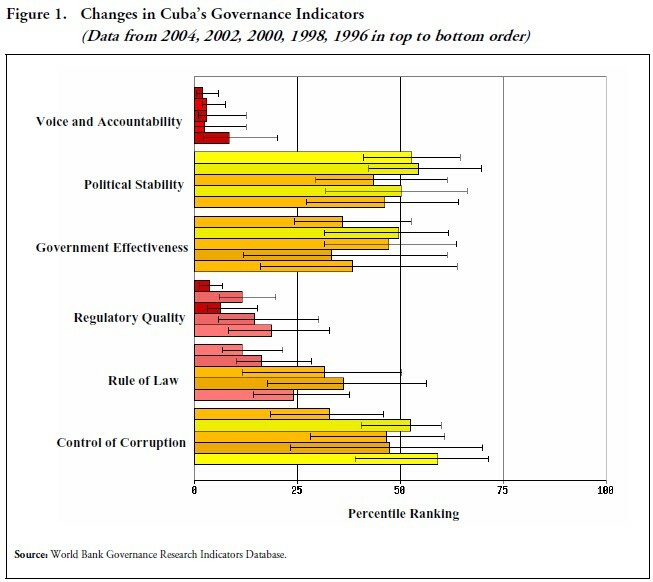 Figure 1 shows that the comprehensive World Bank Governance Research Indicators have charted a significant drop in Cuba’s quality of governance between 1996 and 2004. Trend-lines since 2002 are negative in all six measurable categories, but the eight year comparisons demonstrate a net improvement in political stability and government effectiveness, accompanied by a decrease in regulatory quality, rule of law and control of corruption. Voice and accountability—which measures political and civil rights—also declined from its already low 1996 levels. Cuba’s downward shift in governance is noteworthy because the global data for this period reveal no discernible trend in the quality of governance worldwide; the island ranks among the mere 10 percent of countries that showed a statistically significant change during the last eight years. Interestingly, Cuba’s apparent deterioration occurred at time when the Castro government has demonstrated an increasing preoccupation with controlling corruption within its ranks. Of course, corruption has been a feature of life in Cuba throughout the 20th century, including the years since the Cuban Revolution. Cuba’s First Party Congress in 1975 discussed the problem of small scale corruption at the municipal level, and in 1989, Cuba witnessed the execution of the oncerespected General Arnaldo Ochoa for alleged corruption and drug trafficking. In the mid-1990s, Cuba organized a special commission to fight corruption, headed by General Armando Quiñones of the Ministry of the Interior. But Cuba’s limited economic liberalization during the 1990s produced a new set of challenges that have fueled reports of internal graft, especially through the sectors open to foreign direct investment and in the cash-flush tourist industry. It is unclear whether Cuba’s recent anti-corruption measures reflect a real concern with eliminating corruption, the Cuban leadership’s desire to tightly control the country’s finances, or the micromanaging tendencies of the comandante. Whatever the motivation, Cuba’s focus on controlling internal corruption has generated new policies and institutions to limit the authority of state-owned enterprises over their hard currency accounts. During the last five years, Cuba has taken a number of steps to strengthen internal financial oversight of state-owned enterprises and the larger population. In 2001, the government established a Ministry for Auditing and Control to oversee enterprise transactions. The following year, the new minister, Lina Pedraza, remarked, “There are cases of corruption … that occurred because officials managed economic operations and others because they managed resources,” and she pledged to help maintain discipline over the island’s inventories and crack down on practices such as double-billing and false contracts. In 2002, the Cuban government confiscated nearly 250 houses, imposed 1,900 fines, and removed more than 30 public officials from office to crack down on illegal activities in the housing sector, including unsupervised house swaps and home purchases and improvements made without authorization. In July 2003, the government prohibited state owned enterprises from conducting dollar transactions domestically and instituted new controls for all international purchases exceeding $5,000. By the summer of 2004, the Cuban Politburo was reported to be visiting local branches and warning against corruption within the government. At the time, a video was circulated that quoted Raúl Castro warning against corruption in the tourist sector, saying, “Corruption will always be with us, but we must keep it at our ankles and never let it rise to our necks.” According to Western news sources, an internal report showed that 219 of 593 audits found serious instances of corruption, especially in the tourist sector. In October 2004, Cuba’s Central Bank passed Resolution 80 stipulating that all cash transactions must now be performed using “convertible pesos,” commonly referred to as chavitos. Shortly after the dollar exchange deadline was announced, Cubans lined up in surprising numbers to trade in hard-earned dollars and cherished cash gifts from relatives in the United States. Within two weeks, an estimated half-a-billion dollars poured into the Cuban government’s coffers. Although a devaluation of the convertible peso was widely feared, Central Bank President Francisco Soberón declared, “It would be extremely unwise to change the one-to-one exchange rate after the Cuban people have shown such confidence in the Cuban government.” But Cuba also stopped short of criminalizing private U.S. dollar holdings, as was the case prior to 1993, and it later raised the value of the peso by 7 percent against the dollar. Cuba’s dollar crackdown appeared to be an effort to rein in the capitalist impulses of the government. Over the past year, the Cuban regime has become increasingly aware of high-level corruption within its own ranks, fueled by the large amounts of U.S. dollars funneling through the island’s more than 400 state-owned enterprises. Reasserting central authority over the dollar sectors within the Cuban government has emerged as a leading concern for Castro. Additional mechanisms were installed to monitor all overseas trade, and dollar payments have been centralized into a single account in Cuba’s Central Bank. In January 2005, Cuba’s Central Bank established a sole account for all dollar revenues and formed a “Hard Currency Approval Committee” to monitor all cash transfers involving state-owned companies. The heady days of wheeling and dealing in large dollar sums between Cuban enterprises have effectively ended, and now all significant transactions will occur under Castro’s watchful eye. At an economics conference in February 2005, Castro blasted “self-financing in foreign currency,” the now forbidden practice of allowing Cuba’s state enterprises to manage large dollar accounts. It had to end, he declared, because “A great many middle managers came up, and began committing serious enterprise mistakes and errors. Some very good people ended up in bad conditions when we had nearly 3,000 people working with funds and foreign currency.” In other words, corruption had taken root inside the Cuban government, and draconian measures had to be taken. As a result, the Cuban military has taken on an increasingly prominent role in the island’s economic affairs, with important implications for the future. In 2005, Castro increased the military budget to $1.5 billion, which represents 6.5 percent of total government expenditures. The Cuban Armed Forces have moved aggressively into the tourism industry, and this has provided access to needed hard currency. Military-operated agricultural enterprises do give soldiers access to greater levels of food distribution than is available to the population as a whole. There is little question that the military has benefited disproportionately from market reforms, but this has left the Cuban army increasingly vulnerable to charges of corruption, and resulted in a corresponding loss of prestige. Other institutional practices could be perceived as corrupt. For example, Cuba appears to be seeking greater knowledge about the free-market system, and many officials and academics have worked or studied in capitalist parts of the world. Government agencies like Cubatécnica have initiated the practice of exporting hundreds of business managers to work in capitalist firms abroad, although such training is limited to top intelligence officers and individuals with strong ties to senior members of the government. This is consistent with Cuba’s widespread patronage system, whereby Communist Party linkages are required to ascend professionally in Cuba’s institutions, and connections also facilitate access to housing, televisions, automobiles and travel abroad. At the local level, citizens who volunteer for the “neighborhood watch” groups called Committees for the Defense of the Revolution sometimes receive Pandabrand televisions assembled in China, or other imported items that may not otherwise be accessible. Cuba’s anti-corruption measures highlight the challenges facing the country’s eventual democratic transition. In the present system, Fidel Castro arbitrarily sets the boundary between what is corruption and what is not, and the line shifts often and sometimes without warning. In order to preserve their privileges and their status, those who manage power within the Cuban government have had to cultivate a sense of where that line is headed. Nevertheless, corruption at the upper party echelons is believed to have moved beyond merely mitigating shortages to achieving levels of wealth that far surpass the average of Cuba’s ruling elites. Although the underground economy remains a significant factor in Cuba, the external sector has become the nexus for access to massive revenues. Fidel Castro, not surprisingly, has invoked comparisons with the United States as a defense against corruption, stating, “None of our leaders is a millionaire like the president of the United States, whose monthly wage is almost twice that of all the members of the Council of State and Council of Ministers in a year.” Castro has also denounced his neighbors in the region as “neoliberal friends in Latin America who are Olympic champions of misappropriation and theft since the few who do not steal from the public coffers and state taxes steal from the poor and the hungry.” In the meantime, fueled by high nickel prices, a booming tourism sector, and new investment by China and Venezuela, the Cuban economy is clawing its way out of the abyss that followed the Soviet Union’s demise in the early 1990s. Yet Cuba’s paradigm of excessive government intervention, widespread low-level corruption, and severe internal controls will pose a paradox for a successor regime. While the task of minimizing corruption will be central for any post-Castro government in Cuba, in many ways the potential for a democratic transition will multiply the unknowns. If the Cuban government plots a managed transition from above, Cuba could avoid some of the problems that plagued the privatization process in post-communist countries, but it could also encounter the more extensive problems being experienced today in the market-oriented socialist regimes of China and Vietnam. Democratization by definition disperses power among a much wider range of groups and can extend the range of actors who can demand payment for their role in the decision-making process. At the same time, the possibility that Cuba’s communist government will quickly devolve into a weak state unable to maintain control over its territory raises the specter of institutional breakdown at a moment when large sums of foreign assistance will be entering the country. Another concern is that Cuba is at the hub of a major drug-transit route through the Caribbean that could fuel new problems such as narcotics-related corruption and money laundering. Cuba’s geographical position will inevitably force the island to confront the same threats of transnational crime that affect many of its neighbors. Cuba is located in a direct air and maritime path from South America to Florida, and speedboats from Jamaica frequently transport hundreds of kilograms of marijuana through Cuban and Bahamian waters to the United States. Indeed, the Caribbean region as a whole remains particularly vulnerable to corruption according to Transparency International, and Belize, the Dominican Republic, Jamaica and Trinidad and Tobago were among a small group of countries with a recent perceived increase in corruption. Significant amounts of cocaine continue to enter the United States from the Caribbean, estimated at 160 metric tons in 2001. Although this is less than half of the amount that entered annually during the 1980s, traffickers have increasingly penetrated the Caribbean, and the percentage of cocaine exports from the region to the United States rose from 29 percent in 1990 to 48 percent in 2001. The total trade balance for drugs in the Caribbean is estimated at $3.45 billion, which represents about 3.4 percent of the region’s GDP—a greater proportion than that of other drug source and transit countries in the Western Hemisphere. However, Cuba is thought to play a far less significant role in the drug trade than its neighbors. For example, in the 1998– 1999 fiscal year, the U.S. Drug Enforcement Agency estimated that only 1.85 metric tons of cocaine entered the United States via Cuba. By contrast, the Dominican Republic’s projected cocaine flow was greater by a factor of 3, and Jamaica’s was larger by a factor of 8. The Bahamas and Haiti ranked by far as the largest transit countries in the Caribbean, with an estimated 32 metric tons and 53.9 metric tons respectively. Money laundering—the process of hiding, transferring and investing the revenues from criminal activities—is another powerful source of corruption that often accompanies the drug trade. The OECDsponsored Financial Action Task Force on Money Laundering (FATF) estimates that global money laundering accounts for 2 to 5 percent of world economic output. Money is easiest to catch when it first enters the banking system, but is harder to trace over time or as revenues are funneled through multiple accounts. Criminal enterprises also utilize shell companies, which have no operations except to produce invoices. Though far from the dominant force in money laundering, offshore financial centers, such as the Bahamas or Cayman Islands, have tax regimes that favor illicit transactions. Tracking money laundering will become more complicated as the rise of the euro provides an alternative for illegal dollar holdings. In 1999, an estimated $50 billion in criminal revenues was funneled through Caribbean financial institutions. Money launderers increasingly target the Caribbean, taking advantage of its proximity to major U.S. and Latin American markets, the relative sophistication of its financial industry and the presence of the booming drug trade. In a 2004 report, the Inter- American Development Bank estimated that money-laundering transactions accounted for between 2.5 and 6.3 percent of the gross domestic product of Latin America and the Caribbean. Six of the top 10 countries for money laundering through both bank and non-bank channels are located in Latin America: Argentina, Colombia, Haiti, Paraguay, Nicaragua and Bolivia. Cuba has been perceived as an effective counter-narcotics partner and has implemented agreements with the Bahamas, Colombia, Mexico and Venezuela, as well as the United Kingdom and some other European governments. In 2005, the U.S. State Department released a counter-narcotics strategy document reporting that the Cuban Central Bank has regulations in place to investigate suspicious transactions and trace large deposits. The government has also requested training in combating money laundering from Canada and European governments including England, France and Spain. In 1999, Cuba’s National Assembly criminalized money laundering related to arms smuggling and drug trafficking; it criminalized terrorist financing in 2001. Not surprisingly, the island’s tight currency reporting requirements and state-run banking sector provide a powerful deterrent to money laundering, and the Cuban government’s strict internal surveillance has also kept the narcotics trade significantly at bay when compared to other countries in the region. But maintaining this discipline will be a difficult task for a democratic government unless the capacity of the existing institutions can be maintained under the rubric of a free political system. Given the enormous stakes for the future of Cuban democracy, controlling corruption will inevitably emerge as a central priority for the country’s future leaders. Yet the available evidence on corruption offers few quick solutions for countries that are transitioning to a more pluralistic political system. The World Bank has estimated that corruption costs the global economy about $1.5 trillion a year—about five percent of its total value—but offers few concrete recommendations for reversing the pull of corruption. Popular ideas, such as improving civil service pay or establishing anticorruption watchdogs, often fail to achieve measurable results in practice. Wide-ranging media awareness campaigns have more often than not failed to curb corruption, and anticorruption workshops that focus on journalists or members of Congress similarly have little to show in the way of success. While strong political leadership at the top can help to curtail corrupt practices, there is no way to guarantee that these types of leaders will emerge through the democratic process. Even well intentioned politicians are often thwarted by entrenched interests and the lack of tools at their disposal. State capture thrives where economic power is highly concentrated, social organization is weak, and the political system is not sufficiently developed to mediate competing interests in accordance with the law. In Cuba, where corruption has become a powerful social phenomenon, the task facing a democratic government will prove even more challenging. The likely involvement of foreign donors will further complicate the picture. The United States has already promised a large amount of aid to a democratic government in Cuba, and will encourage international financial institutions like the Inter-American Development Bank, the International Monetary Fund, and the World Bank to follow suit. The U.S. Agency for International Development has begun to prioritize anti-corruption efforts in its worldwide activities, dedicating $222 million to programs targeting corruption in 2002 and establishing anti-corruption programs in two-thirds of USAID missions overseas. The resources diverted by corruption also threaten U.S. security interests by fueling illegal trafficking in people and goods, and fueling terrorism and organized crime. Still, large levels of foreign aid can spur corruption, as competing social groups attempt to extract maximum benefits from the largesse of foreign donors. This occurred in Eastern Europe and the former Soviet Union, and the Asian Development Bank estimates that more than one third of all public sector investment in East Asia succumbs to corruption. Against this backdrop, Cuba will be hard-pressed to avoid repeating the cycle. On the international level, the Cuban government should actively engage with the existing treaties and mechanisms that have evolved to fight corruption in the inter-American system and at the global level. The Organization of American States has developed the Inter-American Convention Against Corruption, first adopted in 1996, which calls for parties to reform their legal codes to combat bribery, promote interstate cooperation to fight corruption, and implement measures to register the assets of high-level public officials, monitor government procurement systems and deter graft within publicly-owned companies. In 1997, this was followed by the Inter- American Program of Cooperation to Fight Corruption, and a follow-up mechanism was developed to monitor and review the countries’ performance in April 2001. The UN Global Convention Against Corruption promulgated in December 2003 should also be joined by Cuba. While treaties alone are a poor substitute for wise domestic policymaking, they will help Cuba to better enlist international support for the battle again corruption. Closer to home, Cuba’s accession to the Caribbean Financial Action Task Force would allow it to work with its neighbors to limit money laundering and other types of financial corruption. In the final analysis, however, the effort to contain corruption will only be successful if there is steady progress on improving Cuba’s quality of governance across the board. Since corruption represents a failure of governance, a focus on adapting and strengthening government institutions will be essential. The democracies that suffer the most damaging levels of corruption often opened the system politically while failing to address the regulatory, legal and bureaucratic obstacles that fuel graft. Improved transparency and greater political freedom must be accompanied by judicious regulatory reforms and changes in the legal structure to permit the development of a market-oriented economy. The current Cuban government’s efforts to impose strict financial oversight could provide an important advantage to a democratic government, by creating systems that can help to monitor usage of funds and ensure that corruption is kept to a minimum. In a scenario where the communist government takes steps to reform itself out of existence, maintaining professional oversight of the enterprise and banking system can help forestall the asset-stripping that occurred during transitions in other parts of the world. The process of political and economic decentralization will have to be well-managed. In the case of Eastern Europe and the former Soviet Union, short-term winners in the reform process are also able to leverage long-term political influence to maintain the distortions that enabled them to profit handsomely at the time of transition. More difficult, but equally important, will be the task of rebuilding citizen confidence in the state, and restoring the social capital that has become depleted during the last four-and-a-half decades. Cuba will require a viable tax system to help maintain social spending, yet a distrustful population may result in high levels of tax evasion, as has occurred elsewhere in Latin America. Effective capitalism requires a legal structure to support it, and Cuba will need to substantially reform the legal sector, which is presently designed to settle disputes in ways that further the goals of socialism. Cuban democracy requires respect for judicial review, which gives judges the power to decide whether government actions are consistent with the country’s constitution. A strong judiciary can help combat corruption and abuse of power. Cuba’s future leaders can take comfort in the fact that, on balance, poor democracies are less corrupt and better governed than poor authoritarian regimes. Nevertheless, corruption cripples democracy, and it has to be addressed systematically, not merely tactically. Tackling corruption will require policies that target the underlying cause: a society that is thoroughly lacking in social trust. By proceeding wisely and with greater transparency, Cuba’s policymakers can remove barriers to democratic freedom and market reform that can restore vital trust in public institutions. It would be optimistic to expect that a democratic Cuba could eliminate corruption in the short term— if ever. However, strong political leadership and steadfast international support can help the island to achieve better governance—an important antidote to corruption and a worthy goal in itself.